Practically any website features information blocks on its front-end, while the contents of these blocks may vary. There might be a navigation menu, a list of related items, supporting notifications or adverts. The DVelum platform features a rather flexible functionality for managing such blocks. Blocks are created in the Block Management Interface. 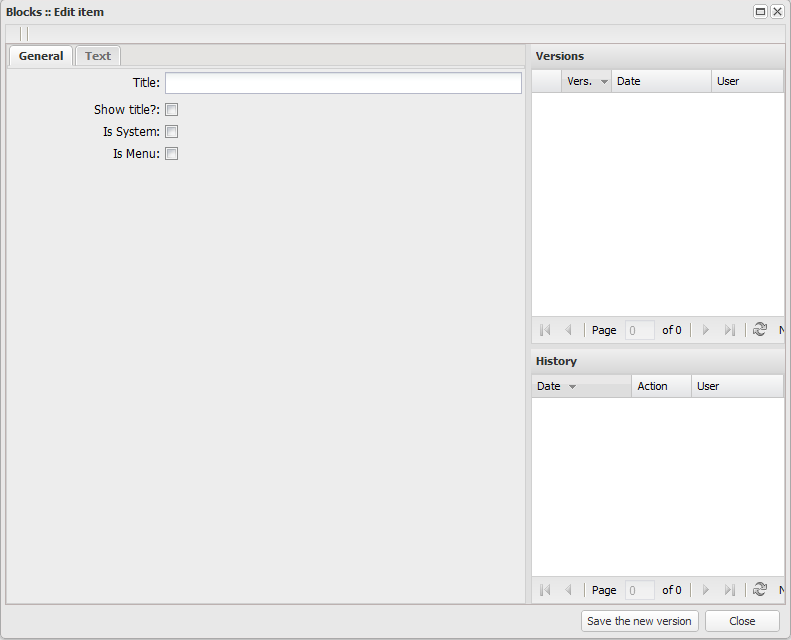 The placement of blocks is set from the Page Management Interface. menu blocks (related to menus). 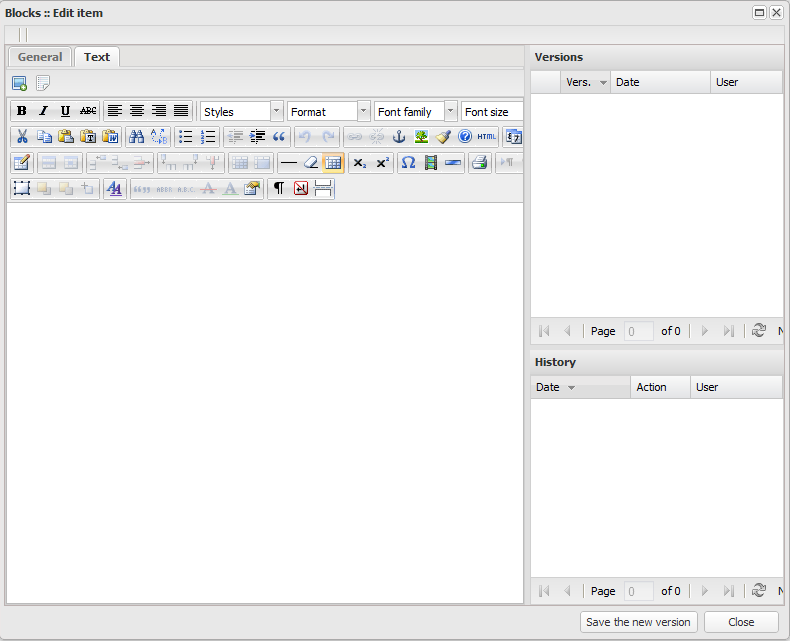 Static blocks are nothing more than regular page elements filled with text or HTML via the visual text editor. Dynamic blocks are page elements with dynamically changing content; each block’s contents are generated by a certain system module (block class). Usually, such modules are deployed by developers depending on the task set, like latest news announcement, for instance. Menu blocks are a kind of dynamic modules with the functionality already deployed in the platform. This type of blocks can display a section menu. the 'Search' field, which helps to find a block by its title text. Please note that blocks may be sorted by clicking table column titles. 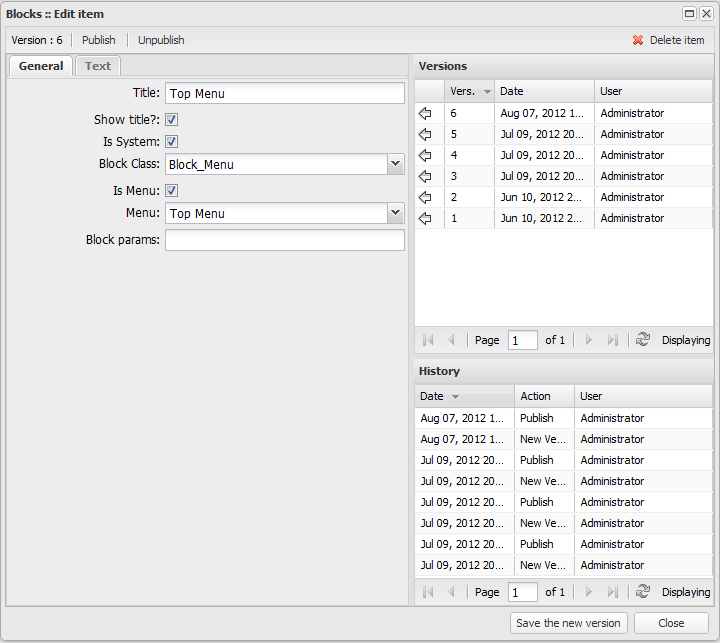 The 'Block Edit' window opens by double clicking the block string in the table. ‘Updated’ column - contains the profile name of the user, who was the last to update the record, as well as the date and time of the update. ‘Save new version’ and ‘Close’ buttons. ‘Include menu’ checkbox - if the checkbox is ticked, a menu dropdown list will be added to the block. The buttons’ functionalities are described in detail in the ‘Pages’ chapter. ‘Block parameters’ - are used to define settings of the chosen class. Upon making the changes, click the ‘Save new version’ button to save the data. Use the ‘Publish’ button to publish the latest version of the block.